Eden Hazard praised Spanish midfielder Cesc Fabregas for “giving everything” to the club amid report of the Spaniard set to join Ligue 1 side AS Monaco. Fabregas was emotional on Saturday as he left the Chelsea pitch following Chelsea’s 2-0 victory Nottingham forest in the FA Cup, having captained the side but missed a penalty. The Spaniard achieved success at Chelsea by winning two Premier League titles, an FA Cup and an EFL Cup after arriving at Stamford Bridge from Barcelona in 2014. Hazard also being part of the successful spells with the Spaniard has described the midfielder in a different term. When asked what the midfielder has offered Chelsea, Hazard said: : “Everything. “In five years, I can say that I was lucky to play with him. Since the beginning, when he came, we saw with the first year we won the double together. “A top guy on the pitch, off the pitch, great friend of mine, not just admiration. I hope he will have a good future. The destination of the Spaniard remains relatively unknown but reports have it that he is set to reunite with former Arsenal teammate Thiery Henry who manages Ligue 1 side Monaco. 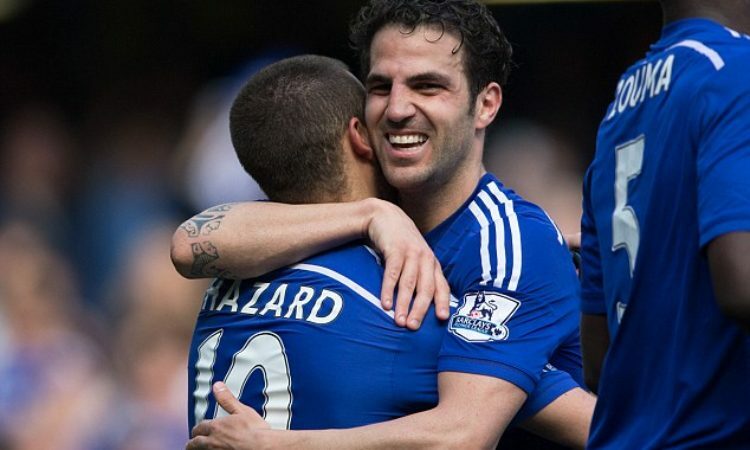 Fabregas in the event he joins the club, is expected to steer the embattled French club out of relegation.